Even though it was cold and rainy, Hohepa Hall was packed as people turned out to see First Nations storyteller Dovie Thomason. Five minutes into her first story and you could hear a pin drop as she held the audience entranced by her tale of the Bear Clan and how they came to be. For Dovie, it's all about communication – and what we can learn from each other. With story we hold a mirror up so that the listeners don't see the teller, but instead they see themselves. Such is the universality and magic of story. The audience felt very connected as Dovie wove another tale, this time about the rock woman, her materialistic partner, and the wolves who took her in and gave her strength. The stories were imbued with respect and understanding of the natural world and portrayed deep wisdom about the human condition. After the interval, Dovie continued in conversation, answering questions from the floor. We heard about her grandmother who gave her own name to Dovie, something almost unheard of in her culture. Dovie is not a shortened name, but a lengthened one - just as she is lengthening the reach of these powerful stories across the globe. 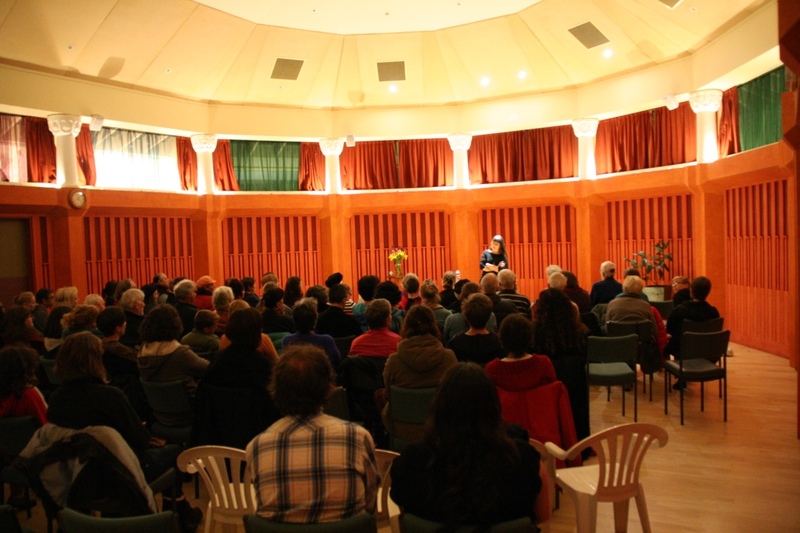 The evening ended on a touching note, as the audience sang the 'Te Aroha' karakia. All eyes and ears were focused on Dovie as she wove her enchanting tales. Hohepa Hall was a cosy setting for Dovie's event. See the event poster here.